Departure Points: Perugia, Spoleto (tour is 1 hour longer from here), Torgiano. Other departure points available. Inquire. Let Well Arranged Travel takes you on a fantastic private tour of Gubbio and Assisi. 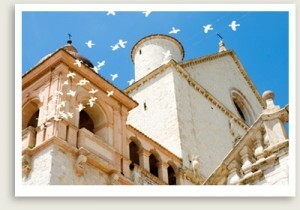 This guided tour features magical Assisi, the hometown of St. Francis, patron saint of the animals. Your guided tour of this spectacular city, built up the steep slopes of Mount Subasio, includes the tomb and Basilica of St. Francis, famous for Giotto’s brilliant frescoes depicting the saint’s life. You will also travel through time through Assisi’s various historical sites, from the Temple of Minerva and Piazza del Comune, both built two millennia ago, to a 13th-century church called Chiesa di Santa Chiara. Afterward, your private tour will take you to Gubbio, one of Umbria’s most picturesque and charming cities. Built beneath Mount Ingino on the eastern side of the Tiber, Gubbio was an important town of the ancient Umbrians in pre-Roman times. Gubbio’s Civic Museum displays the famous Eugubine Tablets, written in Umbrian language using the Latin and the Etruscan alphabets. The tablets, dating from the 2nd century BC, document the Umbrian civilization, from its religion to government. You can take the “birdcage elevator” to the church of St. Ubaldo; afterwards you can descend again to visit the museum at the Palazzo dei Consoli.